The ‘V1100 Discovery’ has been specifically designed with the latest low drag, Semi-displacement hull form for fuel efficient performance, while the fully protected props allow for trouble free beaching when necessary. 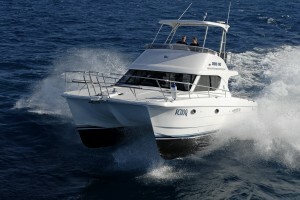 This easy to handle, stable and versatile boat, is ideal for fishing, family, offshore cruising, and charter work. Fitted with twin shaft drive diesels from 125 to 250hp, these vessels can exceed 25 knots, but cruise very economically at 15-20 knots.